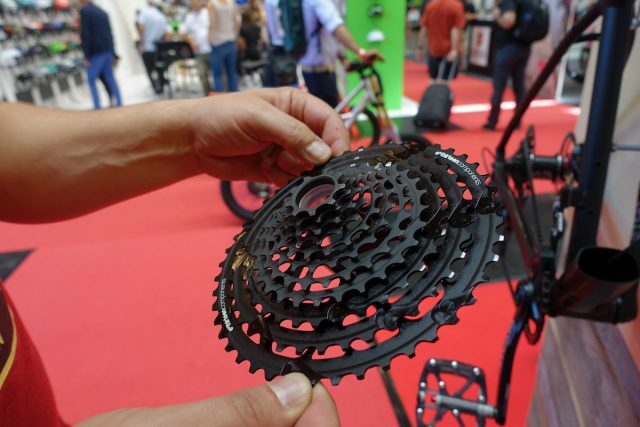 As a company founded on producing chain devices, E*13 have been steadily growing their range over the past decade, having introduced additional drivetrain items such as cranksets, chainrings and wide-range cassettes. They’ve also added complete wheels to their lineup after having absorbed The Hive brand and their unique oversized hub design, and you’ll also see E*13 tyres joining the line up for 2017. 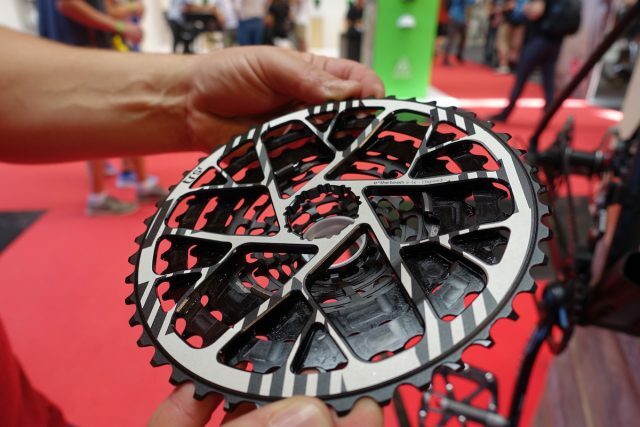 At Eurobike, E*13 displayed its most comprehensive range yet, which included full wheel systems, new cassette designs and a brand new dropper seatpost that looks to set durability as its most prominent feature. E*13 produce complete wheelsets, and now matching tyres too. 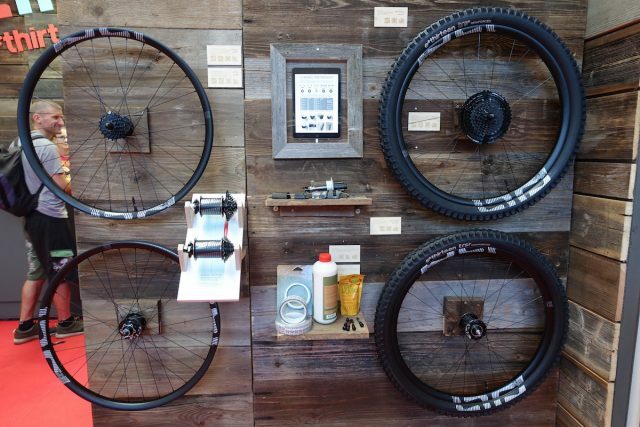 The wheels cover hard-hitting trail territory and DH racers too. 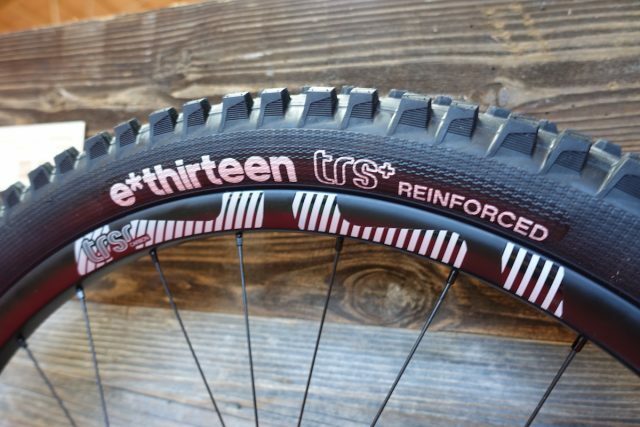 Sticky rubber compounds and reinforced casings make the TRS+ a good looking tyre for enduro racing. Lookout for our upcoming review in the next issue of Singletrack Magazine. 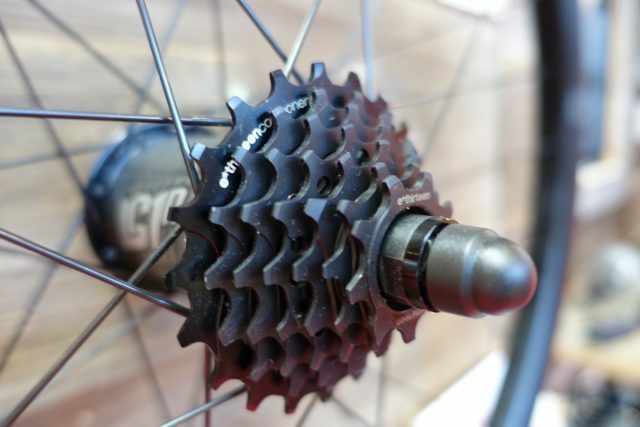 7-Speed E*13 cassette that is specific to their LG1R downhill hub. 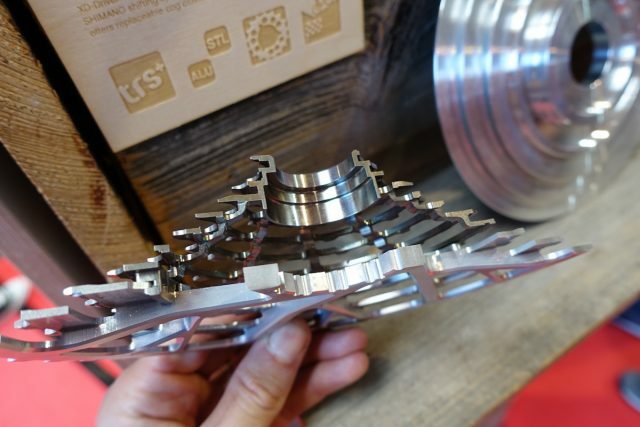 The hub features wider flanges for broader spoke bracing angles. 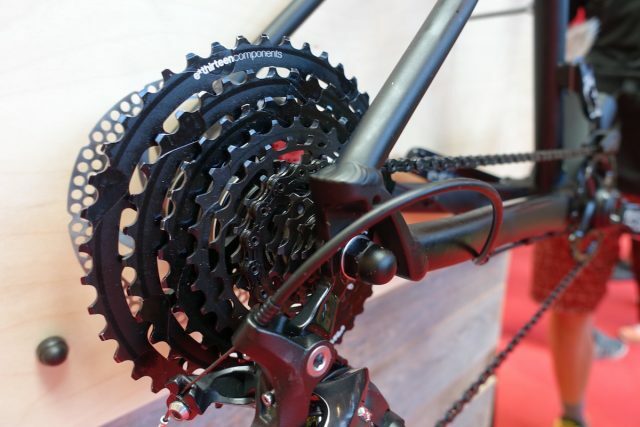 After the success of their 10-speed wide range cassette, E*13 are dropping an 11-speed version that goes to…erm…11. 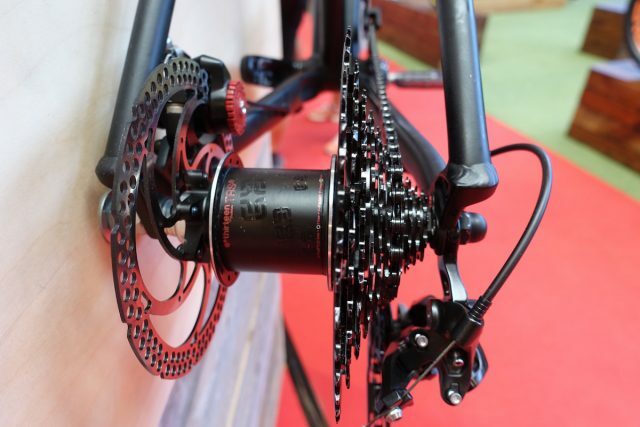 The new TRS plus cassette rocks a 9-46t range, which is absolutely massive. 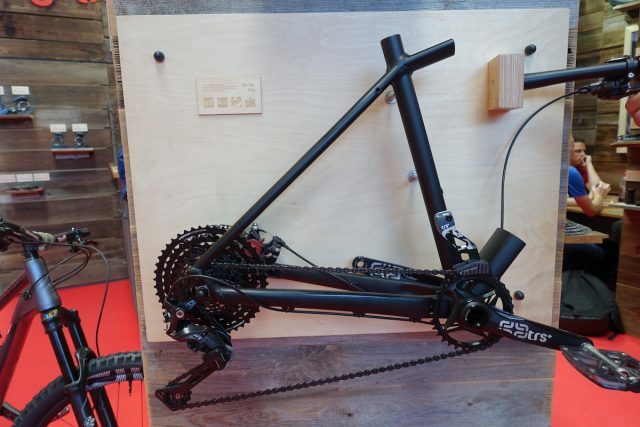 Compatible with long cage Shimano 11-speed derailleurs and any SRAM 11-speed mech. Mounts via the SRAM XD hub driver. 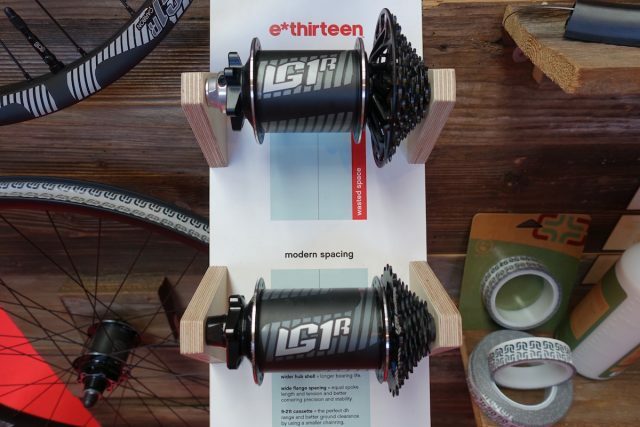 E*13 hub and cassette in tandem on a neat display unit. How’s the size of that 46t?? Tighter range down the lower half of the cassette, with bigger jumps as you get further into the climbing gears. 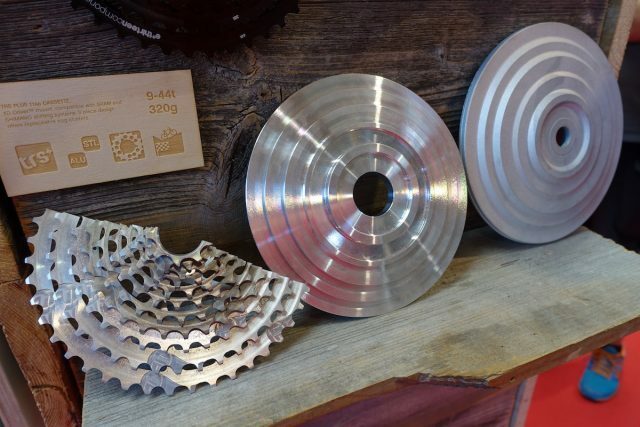 Like their existing wide-range cassette, the TRS 11-speed model features both alloy and steel for the sprockets. However, it’s now a lighter 2-piece design. Crazy machining goodness going on here. Wizardry if you will! 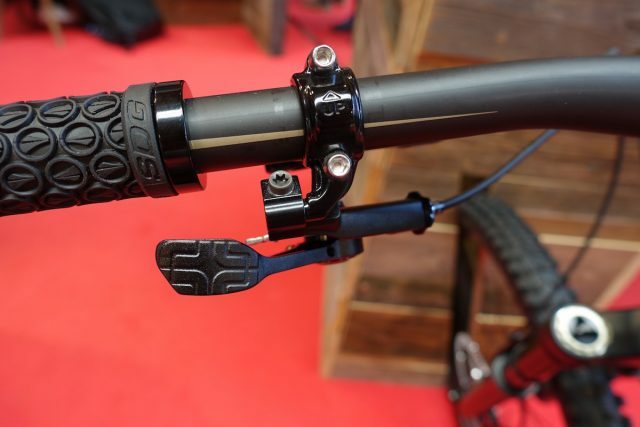 Not a particularly useful design for riding, but chances are Aaron Gwin could still win a World Cup race on it. 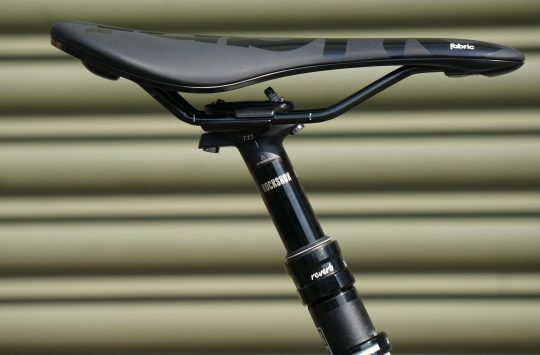 The really big news for E*13 is the announcement of a new dropper seatpost. 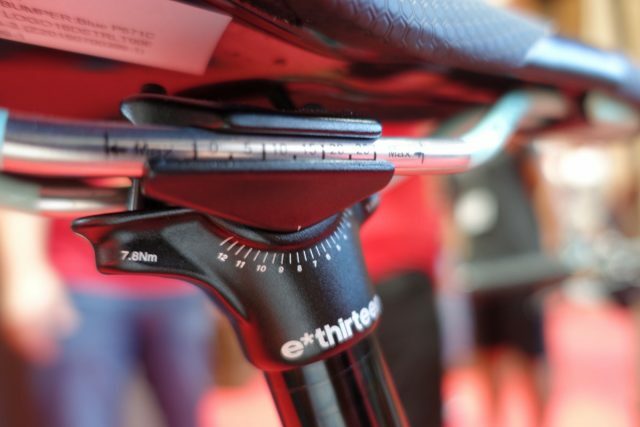 The TRS Plus dropper features 150mm of travel, internal routing, and comes in 30.9mm and 31.6mm diameters. Internal cable routing for a sleek clean look. 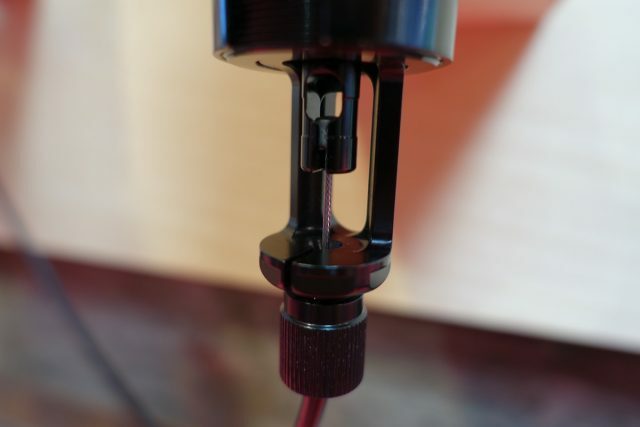 Here’s where it gets interesting: the TRS Plus dropper post is entirely mechanical. 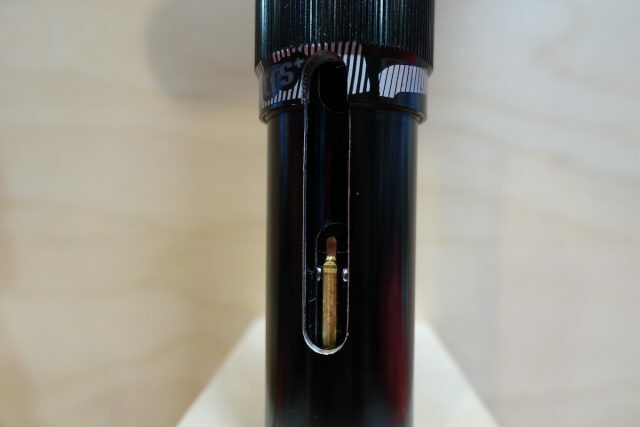 It has a coil spring inside, and an expanding collet system that locks the post into preset grooves at 0mm, 75mm, 110mm and 150mm of travel. So you have 4 positions in total. The cable head mounts at the base of the post for easy servicing. 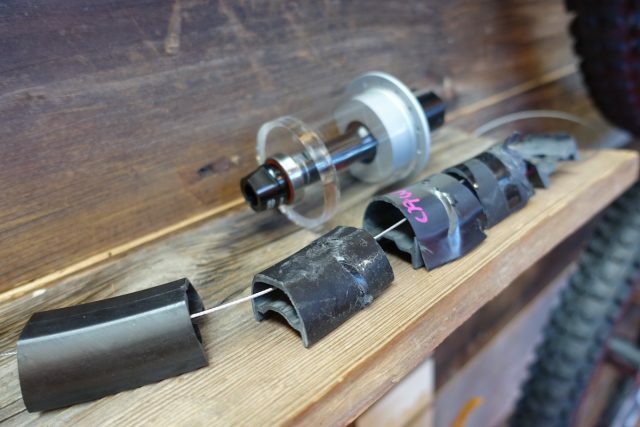 To access the internals, a Shimano cassette tool is used to open up the dropper, and all of the internal parts can be serviced/replaced by the user with the purchase of a ‘Wear Kit’ from E*13. 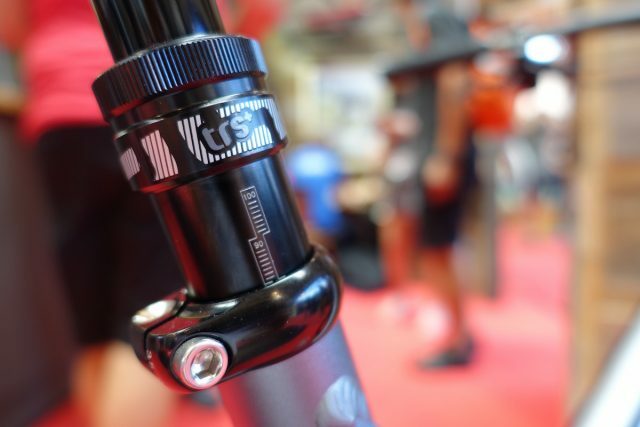 The guys were sick of using unreliable dropper posts, and while they could have released one earlier, they wanted to ensure they had a robust design that wouldn’t crap out on the trail. And the pinch bolt for the cable at the lever end. We likey! 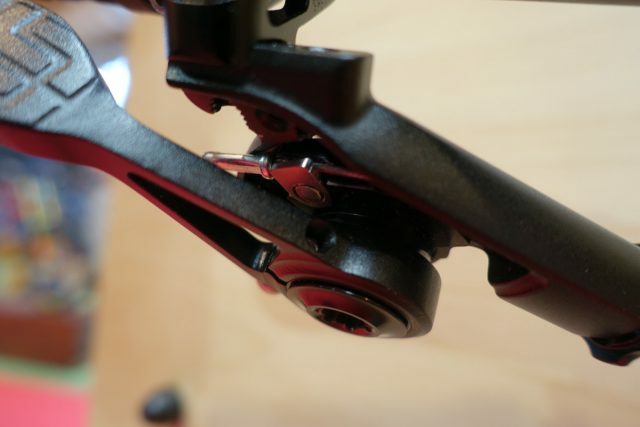 The lever is a shifter-style paddle that offers plenty of leverage for a smooth feel. The display model was very slick in use, and the post is insanely easy to compress, with very little force required. 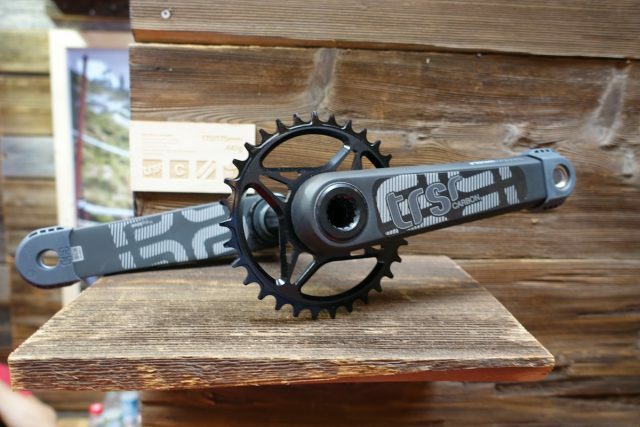 Not so new, but cool nonetheless – carbon TRS cranks with a spiderless narrow-wide chainring. 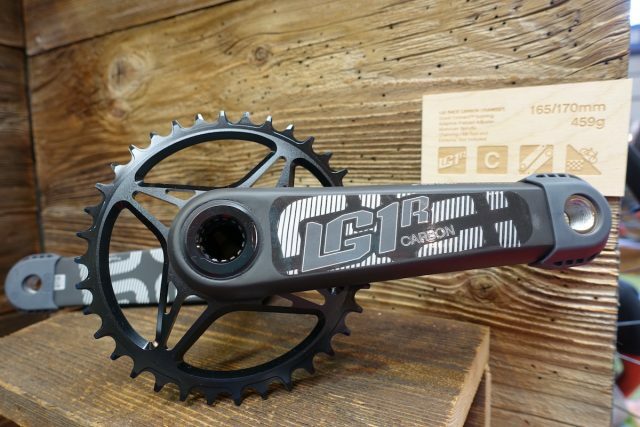 And the downhill version: the LG1R carbon cranks. 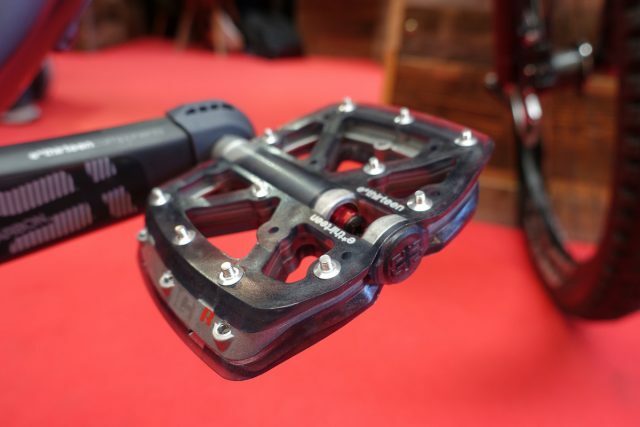 Those unique plastic/alloy/plastic sandwich pedals from E*13. Proof that these guys have been thinking outside the box for a long time! 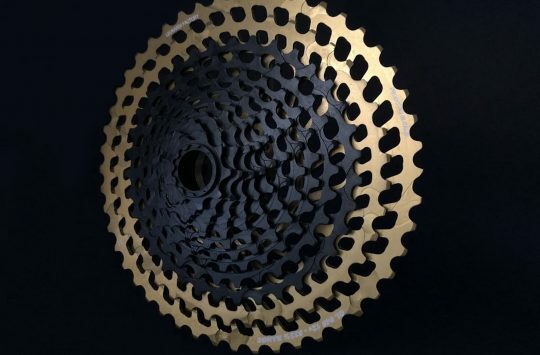 11spd Cassette is 9-44 (not 46) and has been available for months already. As have the tyres! 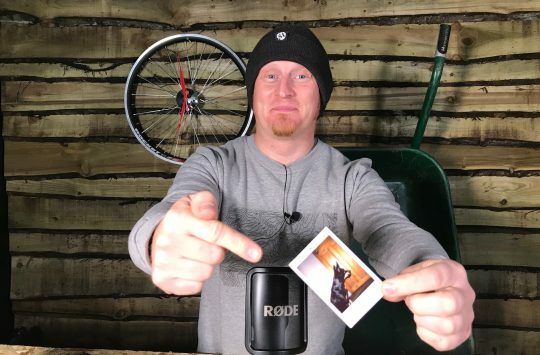 That dropper looks really interesting! No over complicated air cartridges or hydraulics…. 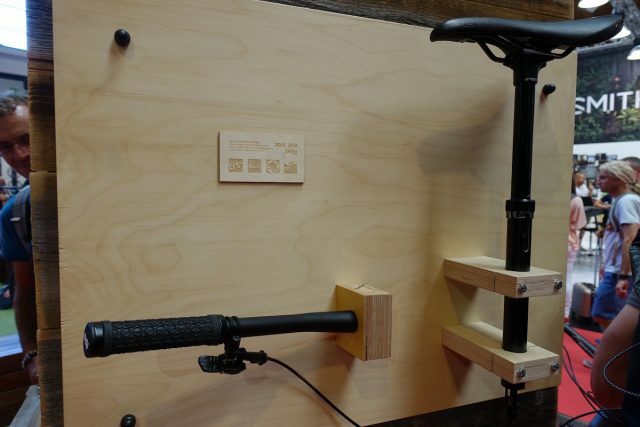 Could they have invented the ‘reliable dropper post’?!? !